This gift guide includes gifts with an extra special personalized touch. 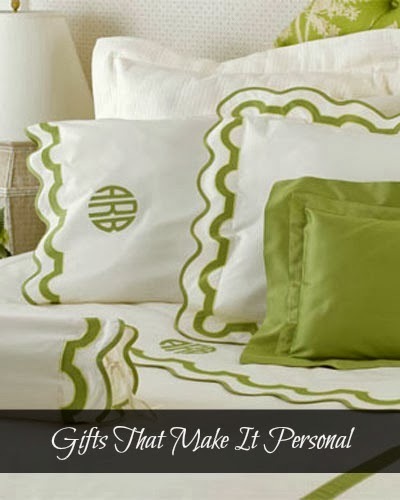 Monograms make everything better and a personalized present are unforgettable. A few of my favorites from below are this ring in gold, this pouch, this bracelet, and this table runner that would be perfect for dinner parties. i have yet to own something monogrammed....but i love giving them as gifts! All so beautiful. I absolutely adore the personalised touch. So sweet and classy too. i've always been a sucker for a monogram! I am OBSESSED with monograms, so these gifts are right up my alley! Great monogrammed gifts! I love the necklaces! Oh my gosh.... so many amazing MONOGRAMMED options! You know, I don't really get the monogram trend. Don't hate me, please!!! wow so many great options here! will definitely come back to your list when I (finally) start my Christmas shopping! Love the trend - esp on those gloves & pillows! Great idea! I never thought about it! Love the personalized touches, nothing makes a gift for more personal then initials. Oh wow monogramed gloves have not seen these before very nice. And I so want a name necklace. I love this idea, really thoughtful and who doesnt like monogramed everything! I love monograms! Especially on unexpected items! love that mustard clutch with the K on it.